iNewsBLITZ is a proven Internet Marketing Solution that lets users quickly create smart, creative and professional looking Email campaigns. Baracci Solutions’ iNewsBLITZ email marketing system is a proven business Internet Marketing Solution. Our easy to use navigation tool lets users quickly create smart, creative and professional looking Email Newsletters, Web Surveys and Online eCards. Moreover, our iNewsBLITZ eMarketing system lets you instantly track your eMarketing campaign delivery status and statistics: see who has read your email Newsletters, who has participated in your online Surveys and who has opened your online Cards in real time. 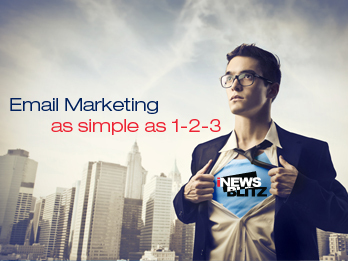 eNEWSLETTERSWith the help of iNewsBLITZ you can create powerful email marketing campaigns. To get started, simply choose a professionally designed email newsletter template, add your logo, your text and your email newsletter is ready to be sent out to your contacts. eSURVEYS iNewsBLITZ lets you easily create Online Web Surveys. Choose from one of our professionally written Web Survey templates or create your own industry related eSurvey. Send it to your contacts and get immediate feedback in real-time as they fill out your Online Survey. ePOSTCARDS iNewsBLITZ Online Cards let you easily stay in touch with your customer base by sending them regular company updates including sale, promotion and coupon eAds, eCards from your travels and Holiday greeting eCards. Visit our iNewsBLITZ website at www.inewsblitz.com to sign up and start communication with your customers the right way!